Unlike a traditional eight-seater raft, the six-seater Mammoth's instant draining mesh floor and wave punching catamaran tubes sends the raft rocketing high over waves and resurfaces quickly after charging through a hole. The Mammoth is the ultimate adventure rafting experience in Canada! 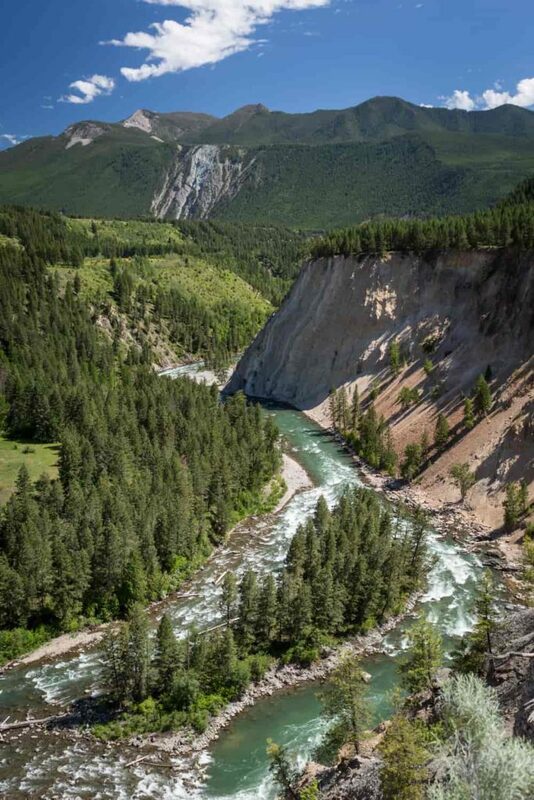 The Elk River Canyon is our most popular run, geared towards adventure seekers looking for Class 4 rapids while rafting through the stunning scenery of towering canyon walls. 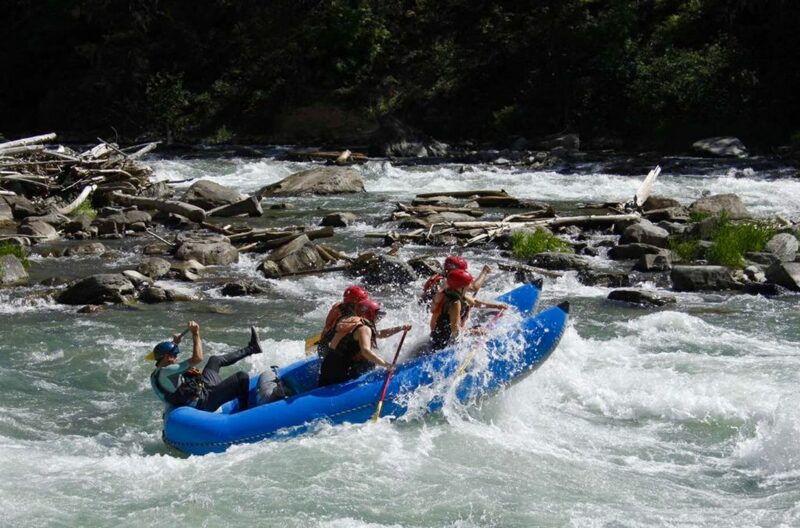 In a Mammoth raft, this is stepped up a notch as even the smallest rapid provides unparalleled excitement. Always a classic, paddlers will get the chance to go cliff jumping, spot wildlife such as bald eagles and mountain goats, and hit excellent white-water features. 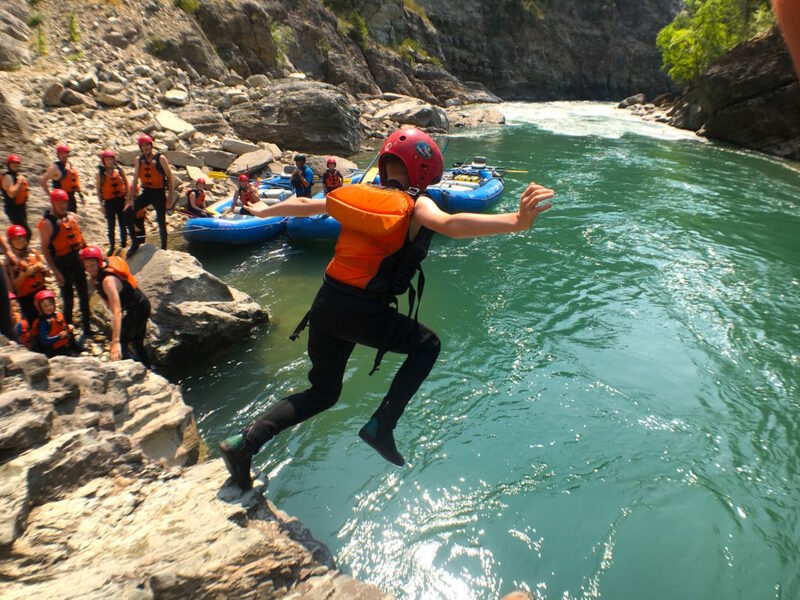 The river is great from May to September and will have the most powerful rapids early season before becoming more family-friendly towards the end of summer. Trips start from our office at the Fernie RV Resort at 9:00 am where you will sign-in and meet your guide. From there, we'll jump on the bus for a brief drive to Elko where the rest of the crew will be waiting. After changing into your wetsuit and gear, we'll make your way towards the canyon for a safety talk. Once done, we'll jump into the rafts and go over and the paddling strokes that will be used during the trip. As soon as your raft leaves the river bank, you'll hit your first rapids. From then on it will be rapid after rapid until lunch. As the day progress, you'll become more comfortable with bigger waves and be ready for more excitement. While you enjoy the scenery and pose for pictures by our photographer, the guides will prepare lunch. You will enjoy a well-deserved and delicious riverside picnic made of build-your-own wraps, fresh fruit, and cookies. After your lunch break, you will get back in the raft for more rapids down the canyon. Towards the end of the trip, the river becomes gentler, where there is an opportunity to do some cliff jumping and swimming. After taking the rafts off the water and stepping into dry clothes, you will hop on the bus for the ride back to the base where you can view the day's photos. Looking for something more conventional? Try whitewater rafting. You will paddle the same 16 km of rapids, but the raft will have a gentler acceleration and be more stable.